My name is Paul Trunick and I am a transplanted Southerner with my own company, ComputerNexus1; we work on and build custom computers, set-up home and small business networks, and design custom websites. I grew up in northern New Jersey, where, as a kid, I raised gerbils, wore braces, and went to the orthodontist like most kids. Nevertheless, the good thing about visiting the orthodontist was the amazing fish tank in the lobby I thoroughly enjoyed with bewilderment every time I visited. I deduce that is what initially interested me in fish and aquariums. Since then, I have always been fascinated with fish. I finally started the hobby back in the early 1990s. I worked at a LFS; I eventually worked up to the leader in the fish department. I learned a lot about fish during those four years and began my first real tank, a 55-gallon freshwater. I tried live plants a couple of times, but to no avail. I kept the tank for another couple of years with just fish until I had to take a little break from aquariums due to work and life, but in 2012 I decided to get back into the hobby and to give growing live plants another try. When did you first started with aquascaping? 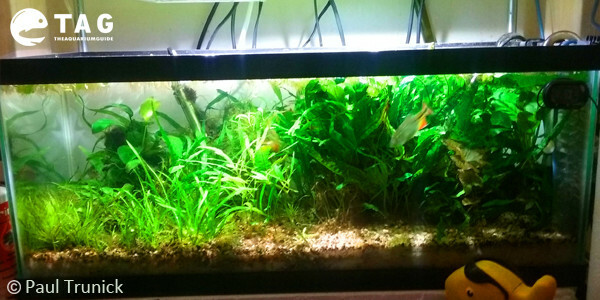 I tried aquascaping with little to no success growing live plants in the early to late 1990s. I am not sure if it was the poor selection of plants or my lack of knowledge at the time, but I ended up with rotted plant material that was foiling the water. 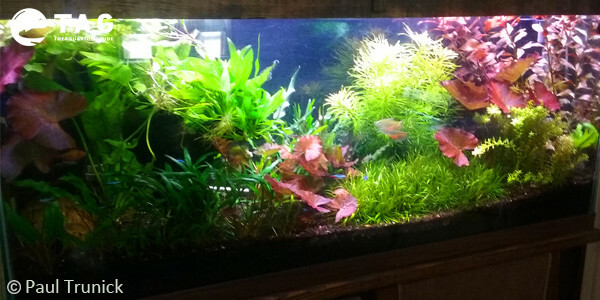 The second time, around in 2012, I was armed with the mighty Internet and YouTube, thus I was able to successfully propagate a tank full of beautiful plants. 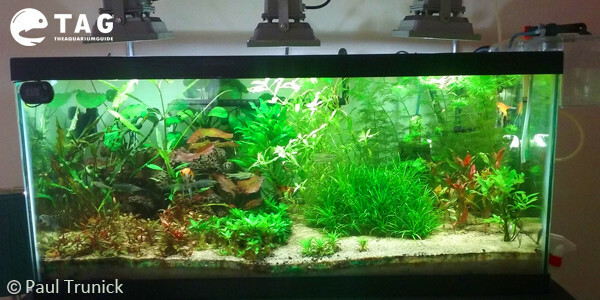 The planted tanks I saw in some older aquarium books I had, which were mostly Dutch styles, initially inspired me. At that point, I decided I had come far enough in the hobby to share my successes and failures with others via YouTube so I might possibly help others who are just getting started in the hobby. I now post videos of all my projects and the lessons I have learned in the past and what I learn as I adjust my way through the live planted tank world. The biggest challenge was learning an aquarium with live inhabitants was not about the inhabitants, what you are really doing is keeping and maintaining water, once you realize and master it, keeping fish and plants alive and happy is a lot easier. I was set on doing an Amazon Biotope style tank originally, which turned into more of a Dutch style/Natural style tank. I think the Iwagumi and Diorama style tanks are interesting, but not realistic when you have fish involved. I personally like a more natural look, like if you stuck your head under water in a river or stream in the tropics somewhere. 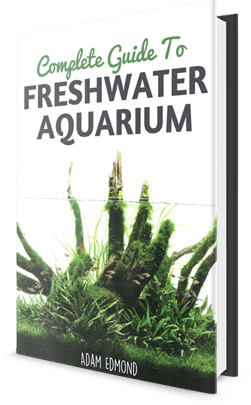 Learn more about the various aquascaping style here. Nature! I mean she has had millions of years to get it right, so who am I to question that?! I do not really have a favorite of either; some days I might think Angelfish are just gorgeous and other days I like the Discus Cichlids look great. The same reasoning rings true concerning plants; there are so many new offerings available and I am sure I have only scratched the surface of seeing all that is out there. When I first got back into the hobby, I resurrected the old 55-gallon tank and decided if I were going to try plants again I would go with a dirt substrate. One of the driving forces behind this decision was money, since I did not want to spend a lot of money on special plant substrate only to fail again. Once I was successful at growing the simpler plants I was hooked; next came a dual t5 108w fixture, then pressurized CO2, another t5 fixture to grow more difficult high-light plants, and finally dry fertilizers. First, figure out what you can afford, which will determine whether to start with a big or small setup. 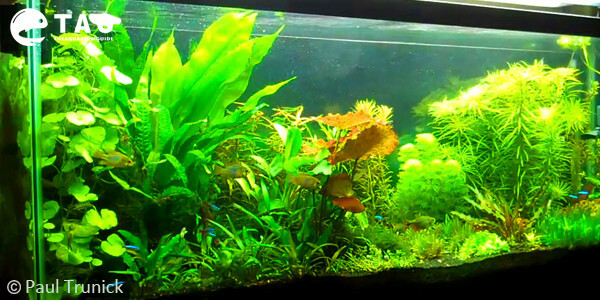 Second, you must know that growing live plants is a time consuming endeavor and if you do not have the time to put into the maintenance and care of your aquarium, then you might as well get fake plants. Now, if you’re still interested, you will want to start out with easy-to-grow plants (Amazon swords, Anubias, cryptocorynes, and such) so you will not have to be discouraged by failure right out of the gate. Once you have a couple of successes, you can build on them, which is much easier to expand into more difficult plants. Also, realize this hobby can become somewhat addictive (as I’m sure my fellow Flora aquarists can attest) and you can easily end up spending a lot of money, thus if you have other responsibilities, you might not want to get involved with it. Please share with us your website/business/page etc. and how can you be contacted? 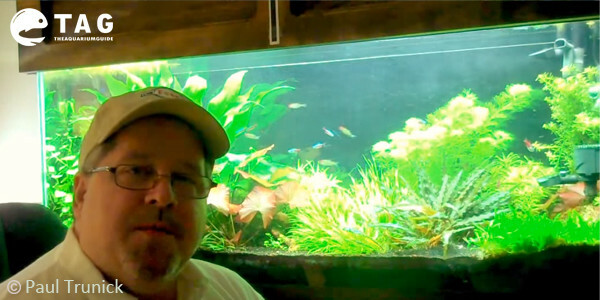 For aquarium, fish, and plant related topics, my YouTube channel would be your best choice – Paul’s Planted Aquariums. I’m looking to communicate with some one that has experience with pea puffers. Before I buy these guys I want to assure their quality of life. I certainly would like to know about successful feeding plans.